Violet is not like other princesses. She’s a plain child with asymmetrical features, unruly hair, and a rough-around-the-edges personality to match. While exploring the ever-changing castle, she and her only friend, Demetrius, come across a forbidden story in a hidden library and are exposed to the insidious whispering of the Nybbas — an old god who has been imprisoned in their world. 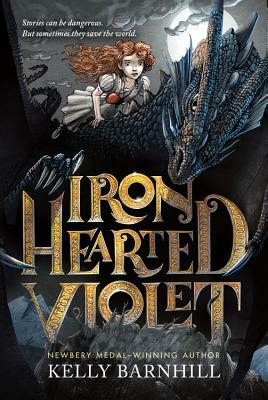 And when Violet’s life starts to fall apart around her, she uses the Nybbas’s power to transform herself, believing herself to blame for the kingdom’s recent tragedies for lacking the beauty of a “real princess.” But she soon discovers that beauty is not all it’s cracked up to be, and Violet devotes herself to ending the Nybbas’s scheming before the kingdom tears itself apart. Told from the perspective of the court storyteller, the narration pops with personality and poetry while still being accessible for a younger audience. Kelly Barnhill has crafted a fine fairytale that turns tropes on their head, with important lessons about the perils of unrealistic beauty standards and the power of love.